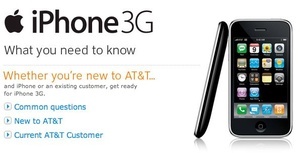 AT&T announced pricing details today for the iPhone 3G, which goes on sale at 8 a.m., July 11. There’s been a little grousing here and there, but for the most part the No. 1 carrier in the U.S. — and its accomplice, Apple — have received a free criticism pass. Now that official pricing is here, we should be disappointed in AT&T and Apple. The iPhone 3G is going to be a heck of a lot more expensive to own. In fact, the whole iPhone 3G pricing scheme smacks of corporate America — a product hits it big, so the next time out let’s milk it for every penny possible. That’s what it feels like. Here’s a quick review of what it will cost to own a brand-spanking new, faster, sexier iPhone 3G. We already know this but it bears repeating. 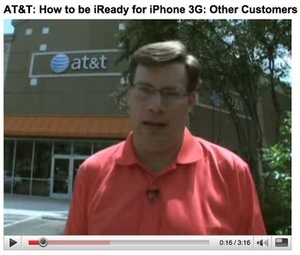 AT&T and Apple are subsiding the iPhone 3G, making it cheaper for consumers to buy up-front. The new 8GB model will cost $199, the 16GB model will cost $299. That’s a heck of a lot cheaper than the $600 early adopters paid for the original iPhone, which was later reduced by $200, then it settled in at $299 and $399 for the two phones. While it looks as though consumers are saving $200, many folks have run the math [Macworld] and are finding that’s not the case. See next item. The monthly subscription will cost you an additional $10, meaning that over the course of a two-year contract, or 24 months, consumers will pay an additional $240 for an iPhone 3G. You’ll be $40 in the hole. This extra cost, supposedly, is because iPhone users tend to surf the Web and check email more than any other cell phone user. They’re using the network more. Well, duh. This feels like when you get something for free — or low cost — and then you’re told you have to pay more for it. Suddenly the bargain doesn’t seem so much like a bargain anymore. That extra cost adds up because you are required to purchase a two-year contract. However, AT&T also said today consumers can buy the iPhone 3G without committing to the two-year service agreement — for an additional $400 [via Financial Times]. Ouch. If you’re curious about the iPhone 3G, Apple posted a guided tour video today which pretty much tells us what we already know about the new hardware and software upgrade. Under the original iPhone contract, 200 text messages were included in the $20 data plan. Not a lot, but enough to get started. If you wanted more, you paid extra — just like it is for all texting plans from the wireless carriers. But with iPhone 3G, texting isn’t included. Consumers will now have to pay $5 a month for 200 messages, $15 for 1,500, and $20 for unlimited. That’s an extra $120 a year for the minimum of 4,800 text messages, which my kid can knock out in a couple of months easy. Suddenly the cheapest plan, which includes 400 minutes of prime talk time, isn’t $69 anymore but $84 or $89 a month with texting — and that doesn’t include local fees and taxes added on to your phone bill. Suddenly, that $200 savings is at least a $160 loss when you add in the more expensive subscription plan and texting. 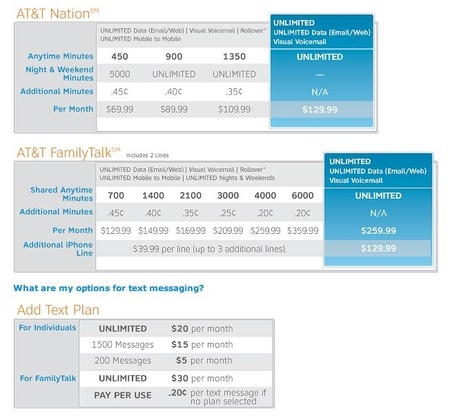 Exactly how much does AT&T make off text messaging? CrunchGear worked up the numbers and found that AT&T’s text messaging will cost the consumer $1,310 per megabyte if there’s no texting plan. Consumers can buy a la carte SMS messages for 20 cents each (up from 5 cents, then 15 cents). There is a one-time $36 activation fee. If you paid this when you bought your iPhone, that fee will be $18. If you want access to Microsoft Exchange features, including push email, you’ll need to buy the Enterprise data plan — starting at an additional $15 a month. If you don’t need Exchange but would like push email “for the rest of us”, a year’s subscription to MobileMe (Apple’s revamped .Mac service) will cost $99 after a free three-month trial. Finally, for current AT&T subscribers, are you eligible for a phone upgrade? This shouldn’t affect current iPhone owners because they bought their phones before July 11. But for those under contract using different AT&T phones, you’ll have to pay more for the iPhone 3G. And don’t forget, if you are switching from another carrier, and you’re still under contract, you’ll be subject to an early termination fee. Will the added cost be worth it? For those who do not own an iPhone and have been waiting patiently to get one, they won’t know the difference. Owning an iPhone will expensive, just like it is for other smartphones on the market like BlackBerry and Nokia. For those who have owned an iPhone from the start, the move to 3G will smart because we never knew how good we had it. The iPhone 3G may be twice as fast, but it’s not half the cost. Google releases new Gtalk Web app; what does it mean? I was planning to get the iphone 3g for my 13th birthday. I was looking for the total cost with a 2 year contract. Thanks for posting this. It let me know what I’m in for. I was looking into the Unlimited plan… Wow!! That is a ridculous amount of money. It seems every plan fot the iPhone is ridculously overpriced. Does Apple have no idea how mych more customers it would have if AT7T wan’t such a price gouger? you people are stupid, its inflation, it happens. “For those who have owned an iPhone from the start, the move (to 3G will smart)<-?) because we never knew how good we had it. I believe you are an idiot. Explain to me how inflation can make the cost of text messages sky rocket. Explain to me why inflation justifies 20 cents for each 160 characters you send someone. It does not cost AT&T 20 cents for the network usage when you send a text, so it can’t be that their charging for the data flow. The people are not STUPID. You just think they are because they realize that they’re getting ripped off and want to say something about it. It’s not Inflation. – It’s apple. Every apple product has a high price. And AT&T (Being the 50+ Years in market) was the highest bidder. Of course Apple is getting their share. As long as Consumers like us, want the latest apple products the price will always skyrocket. 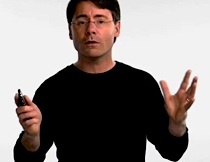 Look at the Apple AirMac. Who’s going to pay $3,000+ for the instant start Laptops? Apparently you are, and your 2 year creditcard bill.. I want an iPhone…, but on a student salary (CA state- laid off salaray at that! Thx Arnold..) Guess i’ll have to wait till graduation..
I’m from India.Can’t I take a month’s contract with AT&T and bring it to India??? I can get it unlocked here for $80(U.S. price). Please let me know if it’s possible.